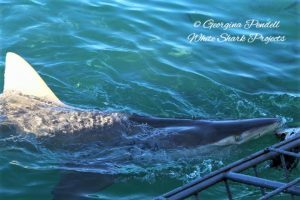 Every year tourists flock to Gansbaai (The Great White Capital of the World) to cage dive with the infamous great white shark. However, this area is rich in biodiversity and great white sharks may not be the only shark species you see around here if you look hard enough. 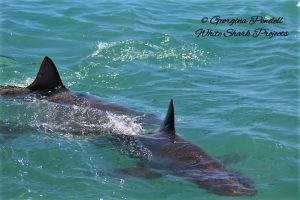 White Shark Projects believe that education is key to aiding conservation, therefore we teach people about all the wonderful sharks that make up Gansbaai’s unique ecosystem. From bottom dwellers to open ocean, from small to large…. Every shark is important for maintaining our special marine ecosystem. The spotted gully shark, also known as sharptooth houndshark, sweet William and affectionately known as “Spotty” to anglers is a species of houndshark endemic to southern African coasts. It is an inshore species preferring sandy areas near rocks, reefs and gullies in depths of around 10 metres but has been found in depths of up to 50 metres. Their favourite food is crab, spiny lobsters, bony fish and cephalopods (E.g. squid). This cute little shark has even been known to chase its prey almost onto the shore. The spotted gully shark usually hunt nocturnally, however, during squid spawning the shark comes out to hunt during the day. 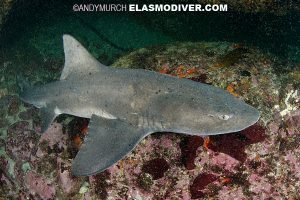 The gully shark is recognised by its grey-brown colour and is covered in small black spots that get more visible with age. It has large fins compared to its body size with its first and second dorsal fins almost the same size. This makes the gully shark easier to identify when compared to catsharks with a similar colour. Incredibly, the spotted gully shark can grow up to 2 metres in length and weigh 50 kilograms. Spotted gully sharks are very slow to sexually mature and they are only able to reproduce once they reach 14 years old. This species is ovoviviparous, meaning the embryos hatch from eggs inside the female’s uterus where they feed on their own yolk sac until they are born. The female can carry between six to twelve pups for up to 2 years and usually give birth between May and August. 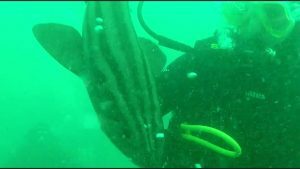 There are various species of catsharks you may find if you go snorkelling around Gansbaai and I must say these are some of the most adorable looking sharks you may find…. 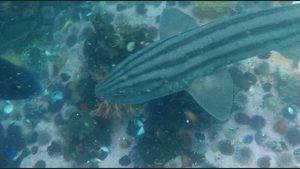 The pyjama shark, also known as the striped catshark is an inshore bottom dwelling species that is endemic to South Africa and found in the southeast Atlantic and western Indian Oceans. They inhabit rocky reefs and kelp beds, in depths shallower than 100 metres. This species was named pyjama shark after the unmistakable dark stripes running down its body, making the shark look like it is wearing pyjamas. It is also identifiable by its prominent short nasal barbels and the dorsal fins are set very far back on the shark’s body. The pyjama shark can grow up to a whopping 1 metre in length. It is primarily nocturnal meaning it hunts at night on things like bony fish, smaller sharks, shark eggcases and crabs, then during the day it likes to hide in caves and in between rocks. The leopard catshark is a very abundant inshore species found around the coasts of South Africa. This bottom dwelling species prefers to live on rocky reefs and kelp beds and sandy flats usually up to 20 metres deep, although they have been found in a depth up to 250 metres. 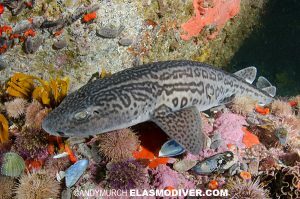 To identify the leopard catshark, it is a little harder as their patterns are so diverse. Their colours range from almost white to black and are covered with diverse patterns of spots, blotches and sometimes lines. 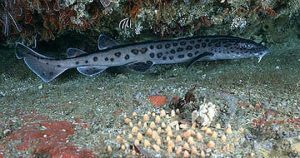 The leopard catshark has a stocky body with the two dorsal fins set very far back on the body, a short head and tail and can reach lengths of 84 centimetres. They also have a long barbel that hangs down from each of their nostrils. They are nocturnal hunters meaning they feed at night and their diet consists of mainly crustaceans (E.g. crabs and shrimp) and squid. 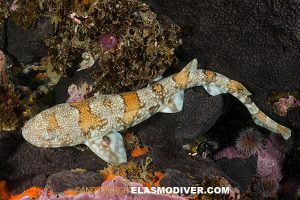 The puffadder shyshark is a species of catshark fondly known as Happy Eddie which is a shortened version of its latin name (Haploblepharus edwardsii). 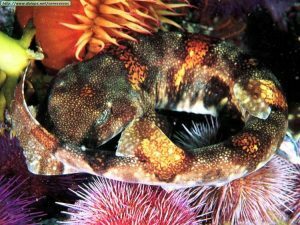 Puffadder shysharks are also endemic to South Africa and can be found near the bottom in sandy or rocky areas to a depth of 130 metres. This species only reaches a maximum of 60 centimetres in length and has a slender flattened body and head. It has the most beautiful patterns with a series of dark edged orange saddle shaped markings down its body and white spots all over its back – these patterns also resemble the puffadder snake. The females diet seem to mainly consist of crustaceans (E.g. crabs, shrimp) while the males seem to prefer eating worms. It is known as a shyshark because when threatened it curls into a circle with its tail covering its eyes apparently like a doughnut shape…. However, I think it looks more like a pretzel. It’s not surprising this little shark is so shy as it is on the menu for cape fur seals and bigger sharks. So if you ever get a chance to travel 50-70 kilometres off the coast of Gansbaai you may see some of our pelagic – open ocean dwelling species. 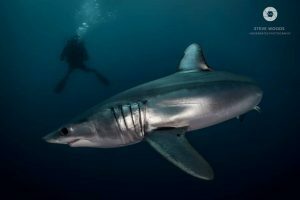 The blue shark is a beautiful pelagic (open ocean dwelling) shark that can be found in temperate to tropical water worldwide, including the offshore waters off the coast of Gansbaai. It is thought that they are found off the coast of every continent except Antarctica. 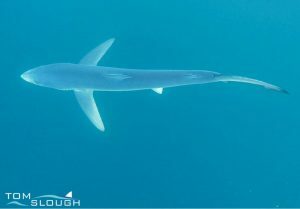 Blue sharks are easily identified by their slender body shape, long pectoral fins, large eyes and vivid dorsal colouration – dark blue on the top, blright blue sides and a strikingly white underneath. Blue sharks can reach lengths up to 4 metres and weigh 240 kilograms. 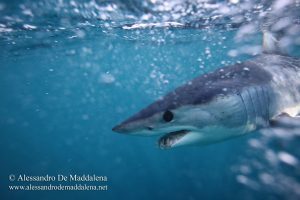 It is thought that the blue shark reaches maturity around 5 years of age when it is roughly 2 metres in length, however more research needs to be done. Blue shark reproduction is viviparous- meaning the eggs hatch inside the female and the pups are fed by a placenta. This also means they give birth to live young and can have a litter of between 4 – 135 pups. The blue sharks diet largely consists of things like squid, octopus, crabs, bony fish, smaller sharks and mammalian carcasses. They also act like little piggies of the sea as they can keep eating until they are almost bursting. When they are full they actually regurgitate their food and then carry on eating. 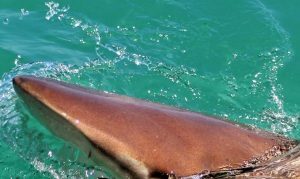 Shortfin makos are widely distributed around the world and are found in both temperate and tropical water, including the offshore waters off the coast of Gansbaai. This species is mainly pelagic but occasionally finds itself in coastal waters. It can also be found at depths ranging from the surface to 150 metres down. It is thought that female makos only reach sexual maturity when they are around 2.7 metres (17-19 years) and males 1.8 metres (7-9 years). 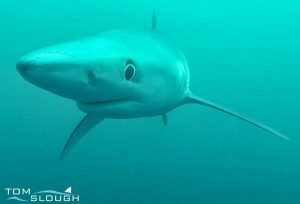 Shortfin mako sharks are ovoviviparous – meaning after fertilisation, eggs are formed and hatch inside the female before live young are born into the surrounding water. Their gestation (pregnancy) lasts between 15- 18 months and they can give birth to a litter of up to 25 pups that are between 70-75 centimetres in length. Shortfin makos have been known to eat game fish such as tuna and swordfish, as well as other bony fish, squid and other sharks. Mako sharks belong to a group known as mackerel sharks (lamniformes) which includes other species such as the great white shark and thresher shark. Just like the great white, shortfin makos have endothermic circulatory systems. This basically means they are “warm blooded” and can keep their body temperature warmer than the water they are in. Incredibly the mako shark can reach speeds of up to 60 mph making it the fastest shark species on the planet. The bronze whaler shark, also known as a copper shark is a species that likes warm temperate and tropical waters and can be found both inshore and offshore. They can be found inshore in the surf zone to far offshore, from the sea surface to 400 metres deep. Bronze whaler reproduction is viviparous- meaning the eggs hatch inside the female and the pups are fed by a placenta. This means they give birth to live young and can have between 7 to 24 pups, with a gestation period of about 18 months. The pups grow slowly and only reach 7 foot in length when they are between 13 and 19 years of age. The average lifespan of a bronze whaler is about 25 – 30 years. Bronze whalers feed mostly on small bony fish, smaller sharks and squid. They like to hang out in a pack and the numbers are used to their advantage when encountering a bait-ball of sardines or a larger prey. Bronze whalers perform seasonal migrations, in response to temperature/seasonal changes, reproductive events (males and females do not co-exist throughout the entire year), and prey availability, for example they are attracted to the annual sardine run. Bronze whalers also migrate to the inshore waters around Gansbaai during our spring/summer and it is always a pleasure to see these beautiful animals. 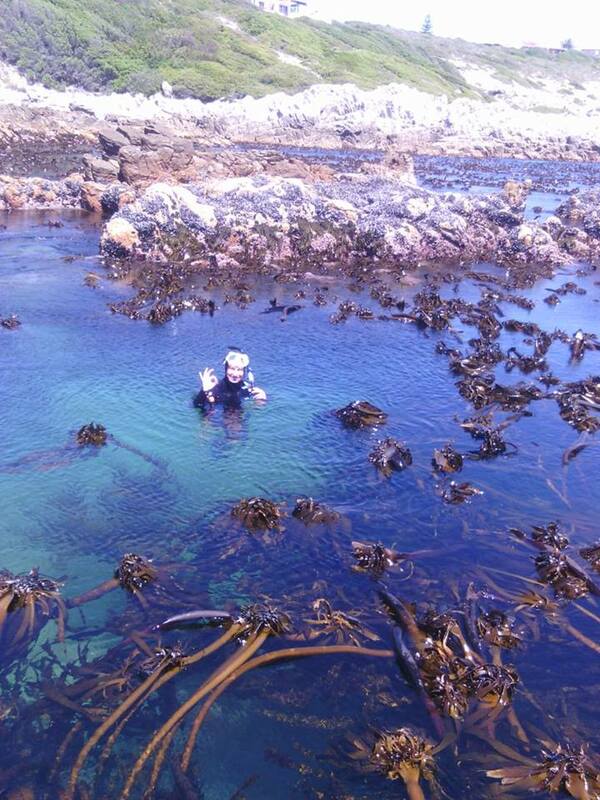 The waters around Gansbaai are teeming with wildlife if you just look hard enough. 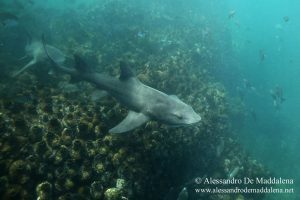 White Shark Projects quite often takes their volunteers snorkelling to look at the wonderful little catsharks and if they are really lucky they might even spot a gully shark.